The incredibly nutritious eggs are a superfood for good health. Not only are eggs good for your overall health; they are, in fact, also immensely beneficial for your hair and skin. Eggs nourish your skin and help make your hair appear healthier and shinier. It is no wonder that they are a favorite among many people. In the United States, egg production totaled a whopping 7.67 billion in just one month, according to the American Egg Board. Eggs are a nutrient-dense, protein-packed food that contains varying amounts of essential vitamins and minerals. “Eggs are a good source of high-quality protein, having all nine essential amino acids… Eggs also provide 18 vitamins and minerals, including vitamin A as retinol, vitamin D, vitamin E, and zinc,” says Dr. Allison Childress, Assistant Professor, Department of Nutritional Sciences, Texas Tech University. They also contain important nutrients like vitamin D, phosphorus, riboflavin, and selenium, along with all nine essential amino acids. Moreover, they are an affordable source of high-quality protein. Apart from being a staple breakfast item, eggs can also be used in your beauty regimen regularly. When it comes to beauty purposes, both the egg whites and the yolks can be used to get clear skin and beautiful, strong hair. 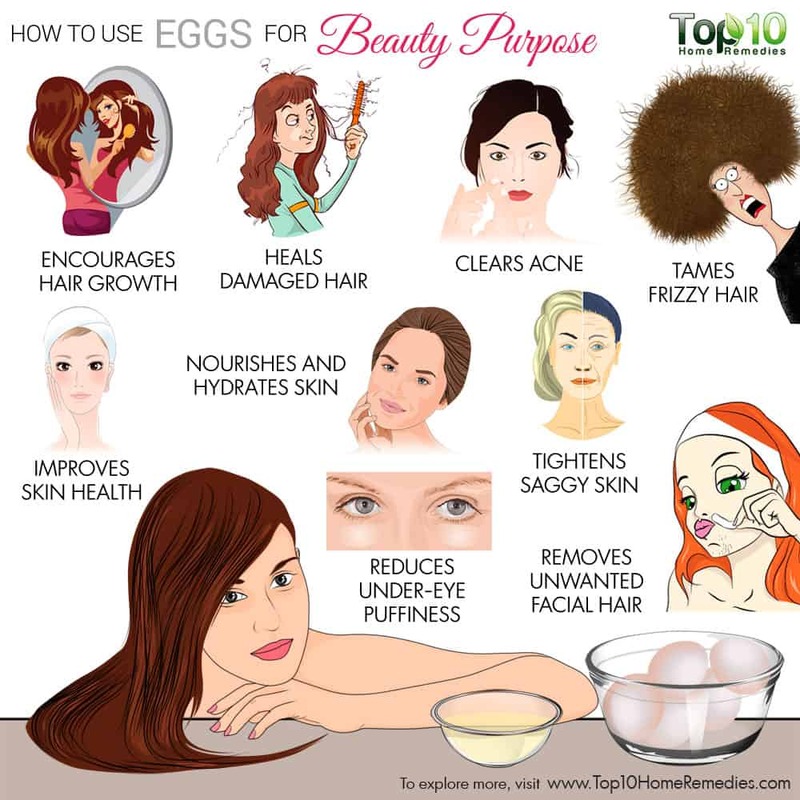 Here are some ways to use eggs for beauty purposes. Whether you suffer from hair loss or thinning hair, egg hair masks are very beneficial. Hair is mostly made up of protein, and eggs are packed with protein that your hair needs to remain healthy and strong. Also, eggs contain iron, sulfur, phosphorus, zinc, and selenium that are beneficial for your hair. “Eggs are rich in omega 3, protein, iron, lutein for eye health, minerals, and zeaxanthin and rich in biotin for hair and nails,” according to Dr. Inna Lukyanovsky, Doctor of Pharmacy, Functional Medicine Practitioner, and Gut/Hormone Health Expert. Beat 2 egg yolks. Add 2 tablespoons of extra-virgin olive oil and mix thoroughly. Apply the mixture all over your scalp. Leave it on for 20 minutes. Wash it out with cold water, and then shampoo your hair. Alternatively, whisk 1 egg and then add 1 cup of milk, 2 tablespoons of extra-virgin olive oil, and the juice from half a lemon to it. Apply it on your scalp. Leave it on for 20 to 30 minutes before rinsing it out and shampooing your hair. You can use either of these egg hair masks 2 or 3 times a month to encourage healthy hair growth. Everyday pollution, exposure to sunrays, poor diet, swimming in chlorinated water, excessive styling, and use of heat-styling tools can take a toll on your hair and leave it dry and damaged. To restore the health of your hair, regular use of an egg hair mask can help a lot. The biotin present in egg helps promote healthy hair growth. 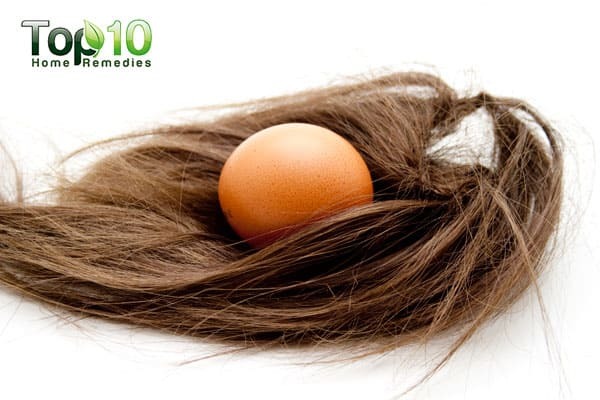 Eggs provide nutrients and nourishment that have been depleted from damaged hair. The good amount of protein, minerals, and essential fatty acids in eggs can nourish the hair strands and impart a natural shine to them. Mash 1 ripe banana, and then add 1 egg and 2 tablespoons of milk. Mix the ingredients thoroughly. Add 2 tablespoons of raw, organic honey and 1½ tablespoons of extra-virgin olive oil and mix again. Apply the mask thoroughly on your hair and scalp. Put on a shower cap, and leave the mask on for 1 hour before rinsing it out with water. Use the mask once a week. Loose and saggy skin can make you look older than your age, whereas firm skin adds an extra spark to your beauty. To keep your skin firm and tight, use egg whites. Being a natural astringent, they help keep your skin firm. Also, the skin-nourishing hydrolipids in egg whites help lift loose skin. “More than half the protein of an egg is found in the egg white along with vitamin B2, required for proper development of skin, lining of the digestive tract, blood cells, and brain function,” says Marianna Ragoussis, Nutritionist, Spoon Guru USA. Whisk the whites from 1 or 2 eggs and 3 tablespoons of milk until you get a foamy texture. Apply it on your face, neck, and any other saggy areas. Leave it on for about 20 minutes, and then rinse it off with cool water. Acne is a common skin condition that usually affects teenagers and adults. It occurs when the sebaceous glands of the skin secrete excess sebum, and the skin turns oily. Oily skin easily traps dirt and other impurities, which can clog the pores and lead to acne breakouts. To cure acne, eggs are very beneficial. Egg whites help absorb excess oil from your skin, tighten your skin, and shrink large pores. They help treat acne as well as fade acne scars and blemishes. Simply whisk the whites from 1 egg and spread it on your face. Cover the egg mask with tissue. Gently remove the tissue and wash your face with lukewarm water. Well-nourished and hydrated skin looks beautiful. You can use eggs to easily prepare a nourishing, soothing, and hydrating face mask. It will moisturize your skin and leave it feeling fresh and soft to the touch. Mix together 1 tablespoon of mashed ripe avocado, 1 egg yolk, and 1 teaspoon of plain or Greek yogurt. Let it sit for 15 minutes or until it dries. Rinse the mask off with warm water, and pat your skin dry with a towel. You can use egg whites to make a homemade peel-off mask to improve your skin health. This peel-off mask exfoliates your skin by removing the dead cells from the skin’s outermost layer and also rejuvenates the skin by clearing out any impurities. Egg whites also help shrink large skin pores, which in turn helps prevent blackheads, whiteheads, and acne breakouts. Whisk the white from 1 egg until you get a foamy texture. Optionally, add a little honey, milk, and olive oil to the mixture. Apply 1 or 2 coats of the egg white mixture on your face. Cover the egg mask with small pieces of tissue. Apply 1 or 2 more layers of egg whites and tissue. Finish with a layer of the whisked egg whites. Allow the mask to dry completely. Gently peel off the mask. Rinse your skin with lukewarm water, pat it dry, and apply a light moisturizer. It is very difficult to manage frizzy hair. But with eggs in your kitchen, you can easily tame the frizz. You needn’t buy expensive conditioners to solve your problem. Being rich in fats and protein, egg yolk works as a natural conditioner for your hair. Also, the enzymes in egg whites help kill bacteria and remove unwanted oil from the scalp. Eggs work as a great hair conditioner. While the egg whites help balance the level of sebum on your hair and scalp, the yolks are packed with protein that strengthens your hair. Whisk 1 or 2 eggs thoroughly. The quantity of eggs depends upon the length of your hair. Add 1 or 2 teaspoons of olive oil and mix well. Apply it thoroughly on your hair and scalp. Visible facial hair on your lip line or cheeks can be embarrassing. But with the use of egg whites, you can easily and comfortably get rid of unwanted facial hair. As the egg white dries, it turns into a hard, sticky mass that works as a peel-off mask to get rid of unwanted hair. However, the trick only works on fine hair, not thick hair. Combine the whites from 1 egg, ½ tablespoon of chickpea flour, and 1 tablespoon of sugar. Whisk the ingredients well to form a smooth paste. Apply it on your face where you have fine hair. Gently peel off the mask in the opposite direction of the hair growth. Rinse the area with cool water, pat it dry, and apply a light moisturizer. Use this treatment as needed. About The U.S. Egg Industry. Industry Overview – American Egg Board. https://www.aeb.org/farmers-and-marketers/industry-overview. Nakamura T, Yamamura H, Park K, et al. Naturally Occurring Hair Growth Peptide: Water-Soluble Chicken Egg Yolk Peptides Stimulate Hair Growth Through Induction of Vascular Endothelial Growth Factor Production. Journal of medicinal food. https://www.ncbi.nlm.nih.gov/pubmed/29583066. Published July 2018. Patel DP, Swink SM, Castelo-Soccio L. A Review of the Use of Biotin for Hair Loss. Skin Appendage Disorders. https://www.ncbi.nlm.nih.gov/pmc/articles/PMC5582478/. Published August 2017. Evans JA, Johnson EJ. The Role of Phytonutrients in Skin Health. Nutrients. https://www.ncbi.nlm.nih.gov/pmc/articles/PMC3257702/. Published August 2010. Selvan K, Sentila R, Michael A. Generation and Characterization of Chicken Egg Yolk Antibodies Against Propionibacterium Acnes for the Prevention of Acne Vulgaris. Indian Journal of Dermatology. https://www.ncbi.nlm.nih.gov/pmc/articles/PMC3312649/. Published 2012. Nimalaratne C, Wu J. Hen Egg as an Antioxidant Food Commodity: A Review. Nutrients. https://www.ncbi.nlm.nih.gov/pmc/articles/PMC4632414/. Published October 2015. Your Natural remedies sounds good I am going to try them right now.